Bring your rod & reel, or rent one! For those who want to stay on land, try the Sunset Beach fishing pier located at Sunset Blvd. & Main Street next to the island's gazebo. Unlike all other fishing spots around town, you don't need a fishing license to fish from the pier. They have one that covers all fishermen, no matter your age. 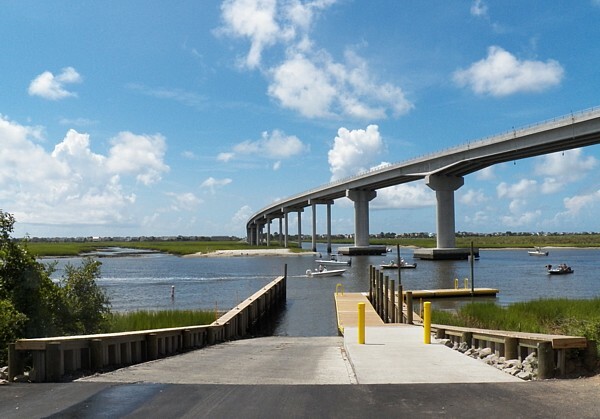 Ocean Isle Beach has a boat ramp located under the OIB bridge past Sharkeys. Underneath the Little River Bridge - US-17 going south towards North Myrtle Beach. FREE with plenty of parking. The best place in town to grab a boat or jet ski for a day is the Ocean Isle Fishing Center on neighboring Ocean Isle. They offer powered fishing boats, jet skis, kayaks, and even paddle boats to cruise up and down the intracoastal waterway.